I absolutely LOVED this dish! My love for lasagna rivals Garfield, so it was no surprise that I loved this so much. 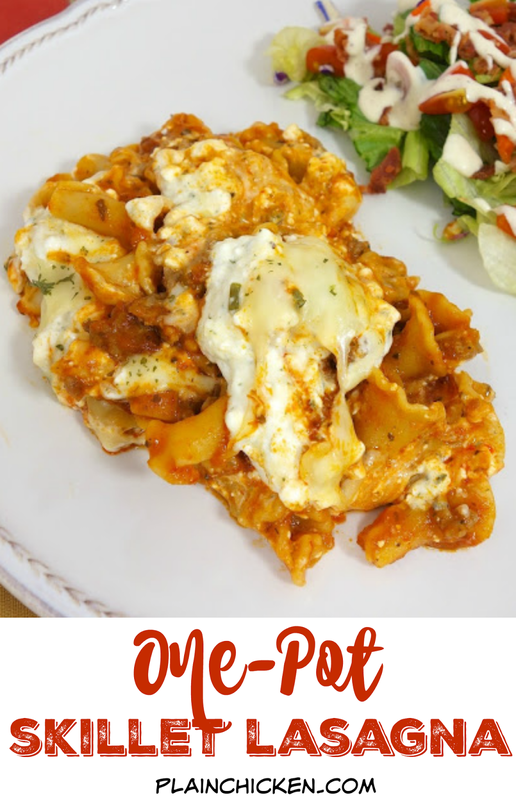 The best part about this lasagna is that it is made in one pot and requires no boiling of pasta noodles! 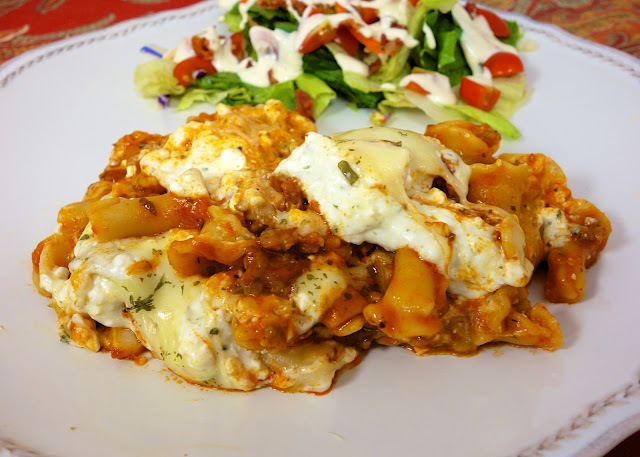 It is so much easier than traditional lasagna. It tastes just like the lasagna that I slave over and it only took 30 minutes! This is perfect for a busy weeknight meal! This dish uses cottage cheese. I know some people don't like cottage cheese (I only like it baked in pasta). Feel free to swap it out with ricotta cheese. Either way it will be delicious! In 12-inch skillet, cook Italian sausage over medium heat for 8 to 10 minutes. Drain fat. Add onion flakes and garlic. Cook for 30-60 seconds, until garlic is fragrant. Add uncooked noodles, pasta sauce and water; mix well. Bring to a boil. Reduce heat to medium-low; cover and cook 15 to 17 minutes or until noodles are done and liquid is almost all absorbed. Meanwhile, in large bowl, combine cottage cheese, cream cheese, Parmesan cheese, and parsley flakes; mix well. Spoon cottage cheese mixture evenly over cooked noodle mixture. Sprinkle with Italian cheese blend. Cover; cook 5 to 7 minutes or until cheese is melted and mixture is thoroughly heated. My husband hates chive cream cheese. Is it necessary to the recipe or can I add more ricotta? you can use plain cream cheese and add a little onion powder. I am not a chive person either. He won't know it is in there. 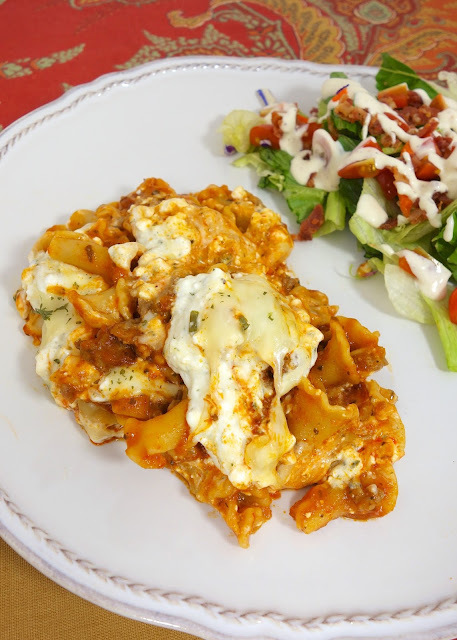 Are you using lasagna noodles? I make a skillet lasagna, but I boil the pasta first. I'll have to try it this way! I love that you only have to dirty one dish! Boiling isn't hard, but this is so much easier! Once again you rock! Pinned! I love one pot meals! This looks fabulous! This looks amazing and I love that you used cottage cheese. I don't like ricotta so I always use cottage cheese when I make lasagna. I definitely have to try your skillet version. I've always made lasagna with cottage cheese too. This skillet version is great weeknight treat! Where did you find campanelle pasta? My local grocery store doesn't have it. How do you think it would work with bowtie pasta? Costco & Target sell camanelle pasta. I think bow-tie would be fine. Enjoy! Looks delicious! I make something similar, but haven't tried it with the flavored cream cheese before (and for those who aren't sure about the flavored cream cheese, I think it's delicious with "regular" cream cheese as well)! Great idea! I agree -- very easy with everything in one pan (and, to the poster above, I have always made mine with the bowtie pasta and it's fine). My kids frequently request this for their "birthday dinners" at home!